Far too often the word mundane carries with it the connotation of a story that will induce ennui. However, the mundane when skillfully deployed and dramatically rendered even a seemingly simple morality tale can be so universal and inviting that things like language, currency, and location are no barriers. Such is the case with the Bulgarian film The Lesson. It’s a film whose title is even simpler than its premise, as the title belies the fact that the financial, and moral, complications a school teacher Nade (Margita Gosheva) faces are intertwined and coming at her from several different directions. The threads that run through this film from beginning to end are: she’d trying to discover which of her students stole a wallet, she’s trying to chase down payment for recent translation work she did for a small company, and then get out of a financial mess in her personal life. Yet, as the case usually is, each of these issues feeds off the other and they are intermingle wondrously. That is not the only thing that’s awe-inspiring here; one nearly needs to be reminded of the fact that this is, in fact, a film that’s co-directed (Kristina Grozeva and Petar Valchanov). The result is such a singular vision you wish there’d be fewer roadblocks to co-directing. 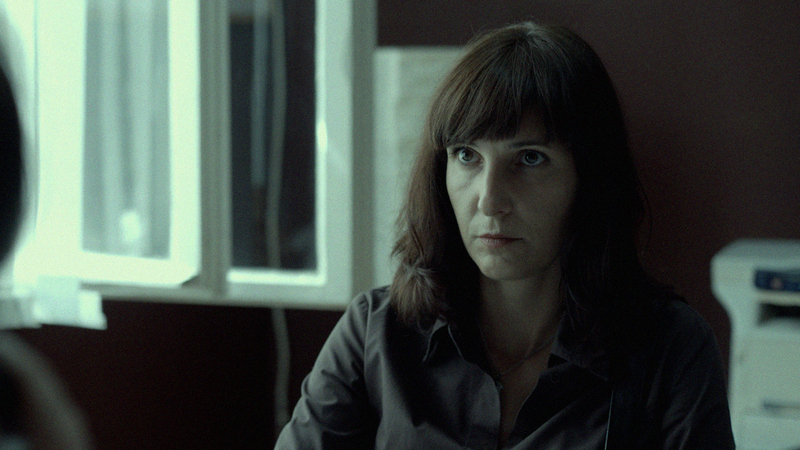 Regardless, in this film Grozeva and Valchanov clearly present a unified, powerful voice that is hynoptic to see. The film becomes a further inspiration when reading the directors’ statement on the Film Movement release. A real bonus of their physical editions but I will preserve that surprise for those that get it, and also further tease that there’s a fascinating short documentary, Crooked Candy, about a man’s lifelong love affair with Kinder Eggs that must be seen by chocolate lovers and the young at heart. The film’s neorealist qualities are an antidote not only to the ripped-from-headlines story but also to the overwhelming majority of films that seem to refuse to acknowledge that small stories can say big things and matter a great deal. It’s a drama that builds itself around relatively miniscule amounts of money, we at times don’t even know the total in local currency until later on (and web searches can confirm what the amounts translate to locally), and the point is they don’t matter. It’s about more than livelihood but survival and trying to do what’s right. The film in its laid back way ups the suspense, about midway through in a way that makes it feel like a traditional third act. An indicator this films 100+ minutes were more than likely built in five-acts. However, there are still surprises, shocks, and drama in store in the latter half. The central figure in the story is Nade. She is the one whom all events revolve around and must take decisive action when all others are unwilling to do anything much less the right thing. The least an audience asks of its protagonist is that they be watchable. Gosheva makes Nade much more than someone you want to watch but rather someone you have to watch. Her magnetism and sensitivity, intelligence, toughness, and at times impetuousness are all identifiable that make her one we’re drawn to whether we always agree with her decisions or not. Love at First Fight is a French dramedy that tells of the relationship between twenty-somethings Madeleine (Adèle Haenel; Aliyah, Three Worlds) and Arnaud (Kévin Azaïs), two young people searching for themselves. The English title promises are far cutesier romcom than the French title Les Combattents (The Combatents), which is far closer to the truth of the matter. The film begins with Arnaud and his brother, Manu (Antoine Laurent) having a contentious meeting with a sales rep trying to to pass off a subpar coffin to them. They storm out and it establishes their line of work, they are contractors and are taking over their late father’s business. Manu is more dedicated than Arnaud, which is part of his internalized and externalized conflicts. Enter Madeleine who is a wannabe survivalist and army recruit, who is in a transitory life-moment herself setting off down this path after earning a few master’s degrees. With this the film introduces its strongest performance and to an extent its largest problem. There is no wit in platitudinal cynicism. To find truth in nihilistic existentialism one needs to find a uniqueness in the characters worth exploring, exploiting, and extrapolating this idiosyncrasy into universality, and this film doesn’t really accomplish that task. And to do so it’s best to not have a character put themselves through a situation obviously predestined for failure, and not only failure but one in the most frustrating way possible. Truly this section does allow the original title top ring true, but as previously stated it does get tiresome. While it is compelling that the seemingly more lost-in-life Arnaud is more comfortable in their self-imposed survival situation, the winding down of the film is overly-languid under-compelling relegating this film to ultimate mediocrity. Azaïs’ performance is sufficiently endearing, Haenel is a true talent and I have yet to even view her most well-known works, but ultimately they are the only thing that makes this film a tolerable pastime. There are films to be seen and to be made about the 21st century malaise not exclusive to Milennials alone, but this is not among them. There are a few gorgeous images, some laughs and the standout leads but the drama is never compelling enough and the sweetheart element is never touching enough. A film about a survivalist ought to be able to keep its head above water better than this. A Wolf at the Door may appear on the surface to be a standard, formulaic Fatal Attraction-style plot transported in location and time. However, where this film differentiates itself is rightly in its reflection of its setting and its lack of concern over traditional conflicts caused by extra-marital affairs but rather it seeks to examine the characters on their own terms, how they interact and how they affect one another. A Wolf at the Door starts with the inciting incident, a crime, a mother (Fabíula Nascimento) reports an unknown woman has picked up her six-year-old girl at school. While being questioned the school teacher starts remembering certain details that give the investigators a slight lead. As they summon the girl’s father (Milhem Cortaz) he confesses to an affair that leads suspicions to center on his lover, Rosa (Leandra Leal). In a tale where at times witnesses are unreliable, and they slowly give more details about what they did or didn’t do, revealing layers of truth; a fractured chronology with frames and some narrative ellipses will be not only preferable but almost a necessity. Much of what makes this film work is the pairing of cinematography and editing in long takes. In these hypnotic shots with slow pushes like a Brazilian version of Fred Kelemen’s work with Bela Tarr the viewer is drawn into the madness unfolding, and it also allows the actors the freedom, and the challenge to work uninterrupted without alternate takes. This continuous imagery with precise movement and mise-en-scène may seem less cinematic to those who have gotten too used to the ever shortening shot-lengths in Hollywood films; however, it’s quite the opposite. It’s astounding to watch on a technical level alone, and much more impressive when you see what it does for this story. Whenever writing on a film produced outside the US, and not in the English language, there is a temptation to do a standard mandatory bit on cultural relativism; especially when its a culture I’m as familiar with as the Brazilian one being a dual citizen. Yet that familiarity with the culture doesn’t guarantee the success of the product in question, just as much as “based on true events,” which this film boasts; doesn’t guarantee 100% accuracy. The cultural relativism bit bears saying here because there are certain plot points that may challenge suspension of disbelief that are quite culturally accurate and ring true. This is another film that is fearless in tackling a taboos, not only in general, but using it as its climactic moment, and that’s as much as bears saying without giving too much away. Because they sometimes get overlooked I will first give kudos to a standout supporting turn in this film: Thalita Carauta, playing a character who only gets thrown into the mix by chance on a few occasions steals every scene she’s in. A bulk of the film is carried by Leandra Leal and Milhem Cortaz, more by Leal for her scenes with Nascimento. They are both magnetic, and precise in charting their persona’s unraveling, and make it quite easy for those shots to hold as long as they do. They turn in two of the most impressive performances to date this year. A Wolf at the Door will be available on DVD and digital video on August 25th. Malika is the leader of the all-female punk rock band Traitors, with a strong vision of the world, her hometown of Tangier, and her place in it. When she needs money to save her family from eviction, and to realize her dreams for the band, Malika agrees to a fast cash proposition: a smuggling run over the mountains for a dangerous drug dealer. But her companion on the road is Amal, a burnt-out young drug mule, who Malika decides to free from her enslavement to the dangerous drug dealers. The challenge will put Malika’s rebel ethos to the test, and to survive she will have to call on all her instincts and nerve. Clearly, Malika (Chaimae Ben Acha) has ample motivation for her gamble. However, what’s refreshing even though she’s willingly getting into a dangerous situation she doesn’t do so naively, nor does she make silly mistakes once she gets into it. In fact, her intelligence and ability to read people is persistently on display throughout. The simplicity of the through-line the story has allows us to become immersed in this world and invest in the characters’ quest. It’s also highly refreshing the way the film absolutely refuses to over-elaborate the situation. Even though a story is about drug-smuggling, which one would assume hinges on a good amount of discretion too many films, even dramas would over-escalate and raise the stakes to ridiculous extents. They are up, there is tension and suspense but priorities for protagonists and antagonists alike are kept in check. There is a big scene in this film where Traitors transforms from a film one can like to a film one can love and that is where Amal (Soufia Issami) is telling Malika her story. They are both riveting to watch in the scene. The information make Amal a major player, changes the dynamic between the two characters, and informs decisions made from that point forward. Traitors is a quickly-paced, engaging watch that establishes a character’s philosophy and puts her in a situation to have the courage of her convictions . It’s highly recommended. This is a family drama told in hindsight. Anne (Sylvie Testud) tells the story of her parents Léna (Mélanie Thierry) and Michel (Benoît Magimel) as Russian emigres in post-war Paris especially after Michel’s estranged brother, Jean (Nicholas Duvauchelle) returns. What’s most intriguing about this film is not just the fact that a daughter is wondering about the origins of her family, specifically what her parents’ life was like before she was born, but the facts that it commingles familial dramas and postwar political intrigue. All too often films that deal with Wold War II in some way see the liberation of Europe as the endgame. Some of the most fascinating European films are postwar, set either during reconstruction or in involved in the politics of a new Europe. This one goes there and furthermore examines some of what happens when you’ve moved past survival and are living with compromises made to move on. Jean arrives enshrouded in mystery. His return to Michel’s life is sudden and almost unceremonious. There’s always some doubt about his nature or identity, but the conflict ends up being one in family rather than the fact that he’s still a Soviet and comrade, and his brother is a communist expat. These narrative elements may seem like they’re too different to connect but when family is involved everything connects. With everything connecting there could be a tendency to lose the characters behind the ideas they represent and to muddle through to a conclusion. What this film does is end its commentaries on family and politics in separate scenes. One in a discussion and one in a voice over to close a tale. Each is astutely stated and a perfectly presented synthesis of hypotheses. The most interesting thing again is that it wanders into gray areas, and fights to explain that gray against characters and a world that insist on black-and-white both in political and familial arenas. When not wanting to lose your characters to your ideas the performances by the actors are crucial. Thierry compassionately portrays a woman torn between her emotions and duties; Magimel plays a cockeyed-optimistic struggling to hold on to ideals in the face of staggering new realities, and Devauchelle a passionate yet embittered cynic seeking unattainable levels of revenge. Each conveys characters as they are and makes you wonder both about where they came from and where they end up. While this film is an origin story of sorts for its narrator, it resists the flashier sacrificial, survivalist beginnings of the characters maturely realizing that life does goes on, and the future is constantly striven for. The film keeps apace on both its fronts working with a smooth ease that allows you to settle in and ruminate on this situation without losing your interest or pushing it too quickly. The balance that For a Woman strikes may be imperfect but it’s not an easy one to strike and it holds on well enough to entertain and provoke thought in equal measure. Set in Granada Cannibal follows a renowned tailor living a double-life. In the his second life he preys and feeds on women, literally. What disrupts his depraved routine is when Nina comes into his life. She introduces feelings of guilt and genuine affection into his life, and from thereon conflicts ensue. With a set-up such as that it can be difficult to see how a film of this kind can be easily watchable. While the facts and some of the events of film are undoubtedly disturbing, it’s the way they are introduced and addressed that makes it clear from the outset the approach here will be different than most. There have been famous cinematic cannibals, of course, perhaps the most notable being Hannibal Lecter. Yet as good as The Silence of the Lambs is there is intended shock elements there, and even more so in some of the sequels. The film opens softly, relatively speaking. After having the facts established as non-grotesquely as possible, we watch much of his routine and how this psychotic is part of his commonplace. The editing of said sequence as well as the framing builds the world effectively. The effect redoubles because of how it works around the viscera. As such it’s not daring you to look away, but daring you instead to continue to look. As intimated, the ritual is not the focus of the film. The film seems like it’ll play out like a revved up version of Jeanne Dielman, but rather than a slow slip from a solitary, maniacal existence it’s a spiral to real consequences as Nina arrives not knowing him, and seeking answers. As such, starting in the second act it patterns itself like a more traditional suspense film. Due to the mitigating factors of this story, and how it starts, you know it cannot end in a very conventional way, and it doesn’t. Another thing that lowers the tenor is the fact that there are narrative ellipses. This means that the film will not dwell on the facts, instead we know what happens, and much as it does in real life, we don’t know where it’s happening or how, or maybe not even that it is happening just that it does. Where the simulacrum attempted in this film really hits home is in the performance of Antonio de la Torre as Carlos, who convincingly portrays the type who many would describe as charming and affable if they met him in a business setting, whom apartment-dwellers would say “nice, but kept mostly to himself” if news reporters came asking about him; and Olimpia Melinte, who is perhaps more compelling because as both Nina and her sister Alexandra she adds to the commentary of the film. Melinte, like her characters is Romanian but working in Spain. She not only performs with equal comfort in either language, but also renders these two sisters as separate, yet clearly related despite having little time to work with one of them. Cannibal works because it departs from an expected course, revels in ambivalence and discomfort; and eschews histrionics. The close of the film is jaw-dropping due to one revelation, if not the overall outcome. Fans of suspense or horror and art house films may find something to like here. Those who appreciate both are likely the ideal target for this film. For any of the above it is worth seeking out. It is available on DVD now from Film Movement. In last month’s post I wrote at length about the Film Movement Film of the Month Club so you can read that to get more insight on it. This film as opposed to the prior I have no ambivalence about whatsoever it is absolutely beautiful and brilliant, there’s an effortless grace and artistry to it all that permeates every frame. There are some astoundingly good cuts in thematic terms and a visual language throughout. Themes weave in and out of the story and never really leave, they illuminate a small truth that is part of a larger whole. All this aside with a perfect ending would be enough but then you have the performance of Magaly Solier. It is the first great performance by a female lead that I saw all year, it is captivating, layered and nuanced. Both in her expression and delivery she carries the film. A film which would’ve been good without all its craft is lifted to greatness by it. The premise is simple; a woman in need of work is hired to take care of a bedridden, dying old man. He dies as does her source of income, with the family away she tries to maintain the illusion that he’s alive. It’s a story that’s also a little more light and humorous than one might expect. There’s drama to be sure but it’s not as dour as all that. It truly is a great film and likely to be amongst my favorites of the year.